AOMORI, Japan, September 6, 2010 (ENS) – The Aomori District Court sentenced two Greenpeace Japan activists Monday to suspended one-year prison terms for trespassing and theft of whale meat from a transport company branch in Aomori Prefecture. Greenpeace condemned the sentences as “disproportionate and unjust” although they were suspended for three years, saying Junichi Sato and Toru Suzuki acted in the public interest by exposing embezzlement and corruption in the Japanese government’s Southern Ocean whaling program. Sato and Suzuki were convicted of breaking into an Aomori branch of Seino Transportation Co. on April 16, 2008, and stealing a 23 kilogram (50 pound) cardboard box of whale meat worth about 58,905 yen (US$700). Aomori prosecutors argued successfully that Suzuki and Sato should have brought their allegations to authorities before taking the meat and demanded a 18-month prison term for each of them. The activists said they took the box of whale meat from the whaling factory ship the Nisshin Maru as evidence that it was destined for private use, which breaches the regulations of Japan’s taxpayer-funded “research” whaling program. “It is obvious the defendants had the intention of illegally obtaining the whale meat because they handled the meat in a way only the owners of the meat can do, including opening the box they took, confirming the content was whale meat and taking it as a sample,” the court ruling declared. Sato and Suzuki said they will appeal the ruling. “The International Covenant on Civil and Political Rights, on which our defense was based, supersedes domestic criminal law, but the judgement did not properly take this into account,” Sato said. Following the news of the verdict Greenpeace supporters hung black flags and banners outside Japanese embassies around the world, to signal that the judgement cast a dark shadow over democracy and civil rights. While commercial whaling has been banned by international treaty since 1986, Japan hunts whales, claiming it needs to kill more than 1,000 whales a year to conduct scientific research. 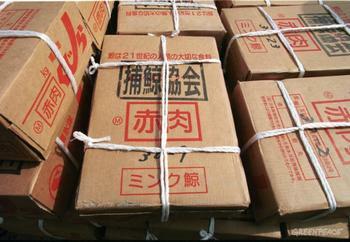 Whale meat from the hunts is sold for human consumption. In January 2008, Greenpeace began an investigation into insider allegations that organized whale meat embezzlement was being conducted by crew members of Japan’s whaling vessel Nisshin Maru, owned by Kyodo Senpaku, which operates the business of hunting whales and selling whalemeat. Following a tip from a former Nisshin Maru crewmember, Sato and Suzuki began an investigation. They found evidence that cardboard boxes containing whale meat were being secretly shipped to the homes of whaling fleet crew members, and then sold for personal profit. 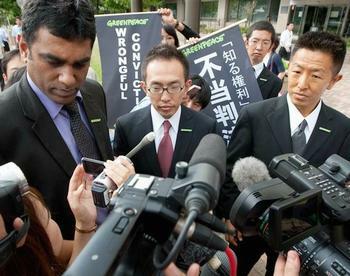 Greenpeace Japan held a news conference May 15, 2008, to show the whale meat to the media as evidence of embezzlement and gave it to Tokyo prosecutors to ask them to investigate five days later. Five days later Sato delivered a box of this whale meat to the Tokyo Prosecutors’ Office and filed a report of embezzlement. Prosecutors dropped the embezzlement investigation on June 20. On that day that Sato and Suzuki were arrested and held for 26 days, 23 of the days without charge. The United Nations Working Group on Arbitrary Detention called the detention a breach of their human rights and said it was politically motivated. Kyodo Senpaku Director Makoto Ito explained to the court that crew members are allowed to take home about 10 kg of whale meat as a souvenir and said the sender of the box Suzuki and Sato took contained some whale meat from other crew members who did not want it. 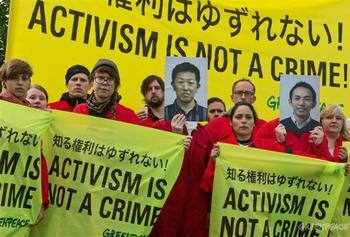 “Activists are not criminals, and to treat them as such has a chilling effect in society, undermining the quality of democracy,” said Greenpeace International Executive Director Dr. Kumi Naidoo, who travelled to Japan to hear the verdict. “The Tokyo Two’s treatment was already a violation of international human rights law. While a suspended sentence is preferable to a jail term, it still constitutes a further failure to respect the rights of two activists who should never have been arrested and charged in the first place,” Voorhoof said. The case of Sato and Suzuki has attracted international attention, from senior political figures, including Nobel Laureate Archbishop Desmond Tutu, international human rights groups and legal experts. During a visit to Japan earlier this year, the United Nations High Commissioner on Human Rights, Navi Pillay, expressed concern about the case particularly with regard to freedom of expression and association. She emphasized the importance of investigations by nongovernmental organizations to society in general and said their work should be respected.